Thompson Wilson specialises in selling, acquiring and valuing Residential Development Land. If you have a building plot for sale, with or without planning permission, or a house needing renovation, Thompson Wilson can provide advice to maximise your asset. Additionally, if your property has development potential, we can advise on the best course of action, at the same time ensuring flexibility, confidentiality and the best price. 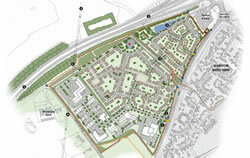 We can act for you individually or on behalf of you and your neighbours as part of a larger development opportunity. Thompson Wilson are fully retained by a number of local and national house builders to find residential development opportunities. These can range from clear sites with planning permission, derelict barns, large back gardens to properties needing renovation, through to large projects such as old commercial sites. Our clients have funding available to give quick decisions. Even if you have already had discussions with potential buyers, we are happy to give a second opinion. Sometimes the situation is not so clear cut. You may not need or wish to sell but would be interested to know how much land is worth. Examples of this can include ransom strips, access problems or restrictive covenants. Or perhaps you are considering buying a plot? Our considerable experience enables us to provide straightforward valuation advice. For further information, contact Mark Wilson, on 01844 273399. "Our considerable experience enables us to provide straightforward advice."